Circuit Complement: 6BA6 RF Amp, 6BE6 Mixer, 6BA6 1st IF Amp, 6BA6 2nd IF Amp, 6AL5 Detector/AGC/NL, 6BE6 Detector/BFO, 12AT7 AF/S-Meter, 6AQ5 Output, 6C4 HF Oscillator, 5Y3GT Rectifier and 0B2 Voltage Regulator. Separate product detector for SSB. Comments:	Ranges: .54-1.6, 1.6-4.7, 4.7-15, and 14-40 MHz. Bandspread: 3.5-4, 6.9-7.3, 14-14.35, 20.4-21.5 and 27-30 MHz. Requires a speaker. 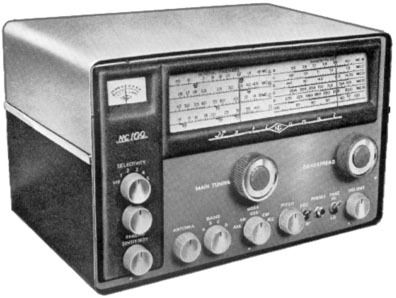 Promoted as "America's lowest priced SSB receiver". See model NC-188. ©1999-2008 by Universal Radio Research. All rights reserved.